RALEIGH, N.C. — Florence exploded into a potentially catastrophic Category 4 hurricane Monday as it closed in on North and South Carolina, carrying winds up to 140 mph and water that could wreak havoc over a wide stretch of the eastern United States later this week. Communities along a stretch of coastline that’s vulnerable to rising sea levels due to climate change prepared to evacuate the storm, which forecasters expect to be close to Category 5 strength by today. The South Carolina governor ordered the state’s entire coastline to be evacuated starting at noon today and predicted that 1 million people would flee. And Virginia’s governor ordered a mandatory evacuation for some residents of low-lying coastal areas. 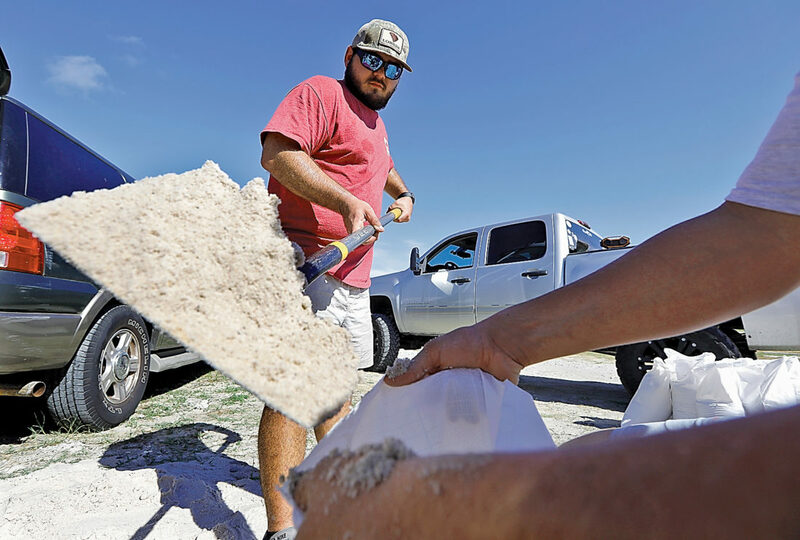 The storm’s first effects already were apparent on barrier islands as dangerous rip currents hit beaches and seawater flowed over a state highway. National Hurricane Cen­ter Director Ken Graham warned that Florence was forecast to linger over the Carolinas once it reaches shore. People living well in­land should prepare to lose power and endure flooding and other hazards, he said. A warm ocean is the fuel that powers hurricanes, and Florence will be moving over waters where temperatures are peaking near 85 degrees, hurricane specialist Eric Blake wrote. With little wind shear to pull the storm apart, Florence’s wind field was ex­pected to expand, increasing its storm surge and inland wind threats. By 5 p.m. Monday, Flor­ence was centered about 1,170 miles east-southeast of Cape Fear, North Carolina, and moving west at 13 mph. Its center will move between Bermuda and the Bahamas today and Wednesday and approach the coast of South Carolina or North Carolina on Thursday, the National Hurricane Center said. Two other storms were spinning in the Atlantic. Hurricane Isaac was expected to lose strength as it reaches the Caribbean, and Helene, much farther out to sea, may veer northward into the open ocean. In the Pacific, Hurricane Olivia triggered warnings for multiple Hawaiian islands as it headed toward an arrival as soon as late today or early Wednesday.